OTTAWA -- A haze of marijuana smoke blanketed crowds on Parliament Hill on Friday as pot enthusiasts of all ages gathered below the Peace Tower for the annual cannabis celebration known as 4-20. The event marks the last time pot users will flock to the Hill to celebrate cannabis culture in late April before the federal government legalizes recreational marijuana later this summer. "What happened here today on Parliament Hill was a gathering of like-minded individuals seeking sensible cannabis legislation," said Kevin Shae, a 32-year-old recreational marijuana user. For Shae, that means ensuring the government does not create a "monopoly of the industry" and making sure those with health issues have the access they need to medical marijuana. Young people and older medicinal users alike were well represented among the expanse of people who stood shoulder-to-shoulder across the west lawn in the heart of the parliamentary precinct. RCMP estimated the turnout numbered in the thousands. Tyler Graydon, a first-time 4-20 attendee, said he and his friends are "excited" to see pot becoming legal. Graydon, 17, is closing in on the minimum age for legal consumption -- it will vary from province to province, but 18 or 19 seems to be the ballpark, likely following on existing alcohol restrictions. Graydon, however, doesn't think it will make much difference. "As soon as it's legalized, it'll be in too many hands to really stop it," he said. "They'll get their hands on it somehow. They'll get it from their parents or from the jar in the cupboard. It won't be hard." By mid-afternoon, police were reporting a mellow vibe with no incidents. For Alex Burridge, 20, this year's celebration is a particularly meaningful one -- he just picked up his first prescription for medical marijuana, which he'll use to alleviate back pain from a sports injury. Legalization, he says, has been a long time coming. "It's something that people have been looking forward to for generations and we're finally on the brink of it. I feel like it's something that puts our country ahead of a lot of others." Fourteen-year-old Emma Boniface, whose mother also uses marijuana for medical purposes, earned cheers from the audience for her keynote speech, part of an effort by organizers to emphasize the importance of including young people in the national conversation about legalization. "I have to trust that our current government and medical system will know what's best for me because I'm a minor and I don't have the right to decide for myself," she said. "My mother is all the proof I need to know that cannabis works." Ottawa paramedics responded to three medical incidents, two of which involved people exhibiting the effects of marijuana use. They were treated and released at the scene. 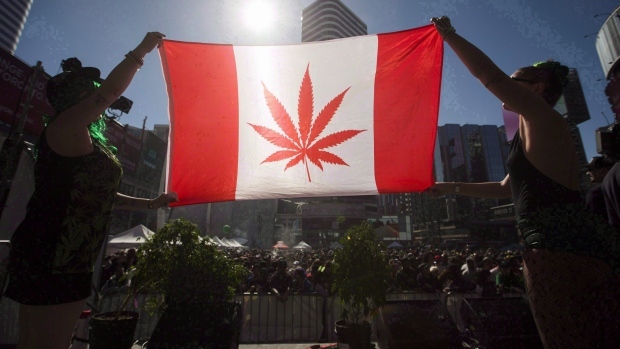 Ottawa was far from the only locale in Canada where 4-20 was being celebrated. Gatherings took place across the country, from Vancouver to St. John's, N.L., where the newly opened Puffin Hut was hosting an inaugural "Weed Olympics." Scheduled events included a biggest bong hit competition, a dab-off and a prize for the most creative joint art. "The perfect way to describe it would be to say it's like being in a martini bar at 12 o'clock on a Friday night, only much more chill," manager Brian Walsh said of the festivities. In Vancouver, venders hawking marijuana edibles, T-shirts and pot paraphernalia set up tents at Vancouver's Sunset Beach. Cannabis activist Jodie Emery said while there is a festival-like celebration of marijuana culture on the beach, it's also a protest -- the sort of event that ultimately made legalization possible. "This is an enormous act of peaceful civil disobedience where people are openly breaking the law and demonstrating that (this) should not be illegal, Emery said -- a reference to the merchants selling all manner of pot products, the sale of which won't be any more legal after the Cannabis Act is passed. "The upcoming legislation actually makes all of this still illegal -- you're not allowed to brand or market. All of these entrepreneurs, hundreds of small business owners, will still be criminals under the Liberal legislation."